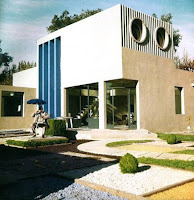 Jacques Tati’s Mon Oncle (1958) had me almost from the very beginning. Some people complain that it’s too long, too simple, too heady for its genre, or lacks a pointed sense of humor, but I was in the right frame of mind to accept its playful tone and easygoing comedy... and I’m pretty sure it was the dogs that put me there. The story of parental and fraternal relationships, the commentary on modernism versus traditionalism, the themes of automation and mechanization and growth – all these were contextualized by those interspersed scenes of stray dogs running through the town. They reminded me at every step: keep your peace of mind, no matter your reaction to this text and your relationship to these ideas. Frustration and argument are stronger forces than urbanism or modernity, and they’re the true enemy of the balanced life. I loved those dogs. If you want a lighthearted movie filled with careful treatments of big ideas, then Mon Oncle may be for you. All the literature notes its commentary on modernism and the mechanization and detachment of modern life, a scary road we were traveling in the 50’s before the chaos of the 60’s came to our rescue. However, no review or analysis captures the number of minor themes this dialectic encompasses: growth and maturity (embodied in Betty the landlord’s daughter), the disconcerting link between modernization and social status (the fishy fountain in the Arpel front yard), the responsiveness of nature as a parallel to the machines (Mr. Hulot’s activation of a bird on a windowsill for music), the burden of hygiene (borne throughout the film by Mme. Arpel), and the inefficiency of “efficiency” (i.e. loud machines and uncomfortable chairs). As far as intellectual content, the film’s biggest commitment is to its aesthetic contrast: the contrast between the aforementioned modernist world of efficiency and detachment, and the evolving, organic world of life and play. Tons of literature has been written about this, and I won’t be able to seriously distinguish myself, but at the very least, I can focus the discussion through my current critical theme: color. The confrontation between hyper-modern and charmingly provincial is embodied in almost every aspect of the narrative, and the production design is no exception. It seems to be a war between two color spaces: the French town is sandy brown, spotted with green underbrush and faded paint, the colors of a dry countryside at the mercy of dust and weather. The second color space is the Villa Arpel, set apart by a gray fence, that places an ordered array of artificial colors on a canvas of bleached white concrete and plaster, the flat gallery-space of synthetic materials. Villa Arpel is a caricature of modernist minimalism, and Tati really invested in getting as close to the subject of his critique as possible. Some authors have observed that the Villa is, in fact, a worthwhile representative of actual modernism, drawing as it does from some very important influences: De Stijl and Mondrian, Josef Mueller-Brockmann, and Jacques Lagrange (less an “influence” than an actual collaborator). The house was recreated in France as an homage both to the period and to the director who critiqued it. Once you notice Mondrian’s influence, it’s hard to see the Villa Arpel in Tati’s film as anything but a big, extended Mondrian painting, with gray and white surfaces, punctuated by objects in highly recognizable colors, made distinct and identifiable by their intense contrast. This is a house you could chart, or organize by color, tailored as it is to visual order… an exercise in formalism and efficiency. The interior of the Villa Arpel is thoroughly artificial (“neo-plastic,” as the De Stijlers called it), but it also seems to be a loving recreation of the outside world, as evidenced by parallels between the Arpels’ gadgets and the mechanisms of nature. The electric eye that controls the Arpels’ garage is a fascinating device, but we’ve already seen something like it, a bird perched outside Mr. Hulot’s window that seems to be photosensitive: whenever the reflection of the sunlight hits it, it starts to sing, like a solar-powered stereo system. Mr. Hulot turns it on at every opportunity. A cold and unresponsive modern kitchen is a fetish for Mme. Arpel, just as a street vendor is a figure of obsession for the group of boys who Gerard accompanies; turning the food, cooking it, and depositing it is a key function of the cultural architecture, but only the human vendor can be truly responsive to the desires of his customers. In addition, the parallels between the dogs and children might seem compelling, but better and more subtle: the juxtaposition of the stray dogs with the herds of black-and-white automobiles, which traverse the artificial landscape like the dogs travel across the natural one (and like the cars, the dogs always seem to be moving, occasionally pausing at a destination and then continuing on their way). It’s a rare film that uses bright colors to communicate dull inertia. Tati’s use of primaries is certainly a critique, but it’s a good-natured one – there’s nothing malicious or immoral about the Villa Arpel. Rather, contrasted with the engaging complexity of the outside world, the interior of the Villa seems like it’s made for small children, right down to the primary colors and pressable buttons. The Arpels live in a world made for easy manipulation and simple pleasure, almost patronizing in its blatant plasticity, and they feel that this emotionally-regressive environment provides the most advanced life they can lead. It’s too child-proof even for Gerard, who’s grown up past the age of arranging plastic chairs and turning knobs and pressing buttons. Villa Arpel is a toy universe, and its residents are, in a certain way, a pair of chubby adult babies. If this wasn’t a comedy, it might be a bit tragic. Maturity, as a human trait, is given only passing attention in Mon Oncle, in the character of Betty Schneider, the landlord’s daughter. Her role is one of the most cryptic in a generally transparent narrative: she starts the movie as a young girl, and in the course of what appears to be a couple months at most, she becomes an adolescent, and then a grown woman. It’s a narrative idiosyncrasy, and yet it fits into the construct, at least in spirit: Betty is another token of Tati’s reverence for human life, caught up in slow changes that seem to happen overnight. In a film populated by children, childlike adults, and artificial playgrounds of amusements, she is an emblem of the real world, where all these things… childhood, uncertainty, employment, wealth, and modernity… are just phases in an endless transition. Of course, I’ve only grazed the outer shell of Mon Oncle’s conceptual substance, and there’s a lot more I could talk about. However, when I try to cover all these themes, I end up wanting to write a whole book. This is, after all, a robust film for interpretation, playful, often absurd, and interconnected in a deeply organic way. This process of interpretation threatens to undermine the real genius of Mon Oncle: the fact that it’s a fun, easygoing film, and that it would rather entertain you than inform you and eviscerate your cognitive faculties. Remember the dogs.